Doing low carb but craving pizza? Well, this low carb pizza is going to hit the spot. The crust is adapted from the original recipe on Jamie Van Eaton's Your Lighter Side blog. It's amazing that cauliflower can taste so much like bread. The recipe takes a little effort, as there are several steps, but trust me, it's worth it. Enjoy! For a different take on pizza crust, check out UpLateAnyway.com. Elizabeth has created a genius stromboli recipe which is easily adapted to pizza crust, and I have to say, it's rapidly becoming my favorite pizza and low carb bread base. I've found if I roll out her stromboli crust thin enough and only add veggies to the pizza before baking, it comes out pretty crisp. If I want meat on it, I just partition out some sauce, combine it with any meats (sausage, pepperoni) in a sauce pan and add them at the end with a little more cheese on top. 2 cups shredded mozzarella cheese, chopped into smaller bits in a food processor. Preheat the oven to 450F. Grease a 17 x 11 cookie sheet with olive oil. In a large skillet with a lid, melt the butter and add the onion and cauliflower. Saute the vegetables over low to medium heat until the cauliflower is almost done. Add the water. Cover and steam until the cauliflower is completely soft. Remove from heat, transfer to a glass or ceramic bowl to cool. While cauliflower is cooling, add the italian sausage to the skillet and cook until done, breaking it up into smaller pieces with a spatula. Remove the sausage from the skillet and drain on paper towels to remove excess fat. Set aside to cool. Once cauliflower is cool, measure out 3 cups and place in a food processor. Process it to smooth consistency. Scrape the pureed cauliflower into a mixing bowl. Add the eggs, minced mozzarella cheese, spices and parmesan cheese to the cauliflower. Mix well. Using a spatula, spread the cauliflower mixture on the greased cookie sheet. Try to spread it out so that it is an even thickness all over. Bake the crust at 450F for about 20 minutes, or until surface looks cooked and it's brown around edges. While the low carb pizza crust is baking, chop up the cooked sausage into finer pieces (you can just whirl it in the food processor for several seconds). Pour the jar of Ragu sauce in a small saucepan, and add the chopped italian sausage. Cover and bring to a slow simmer over low to medium heat. When the crust is done, take it out of the oven, and switch oven setting to broil. Oven shelf should be about 4 inches from broiler. Pour the sauce and sausage mixture over the top of the crust, and spread around with a spatula. (It will be a very thin coating). Cover the crust and sauce evenly with the Italian cheese blend. Put the low carb pizza back in the oven, and broil until cheese melts and begins to bubble and brown. 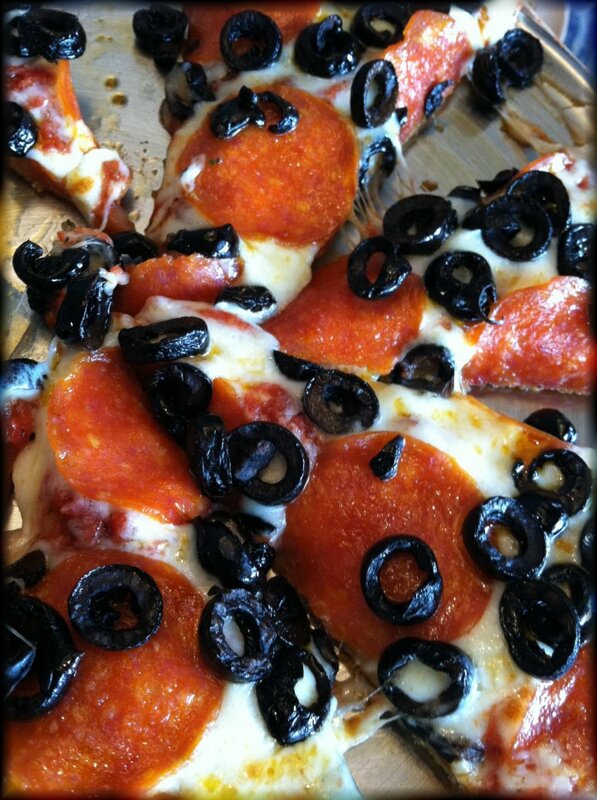 Remove from oven, cut into 12 slices with a pizza cutter. Nutrition information: Serving size = 1/12 of the pizza: 318 calories, 23 grams of fat, 21 grams of protein, 8 carbs, 1 gram fiber, for a net 7 carbs per slice. Instead of sausage, add other cooked low carb vegetables to the sauce - peppers and mushrooms for example, and then top it with fresh olives. This variation will be lower in carbs. Use cooked, chopped pepperoni instead of the sausage. Carb counts will be about the same as the sausage pizza.